Photoshop's keyboard shortcuts can save a bunch of time. Rather than mousing to the Toolbox to select the Brush tool, just press B on the keyboard. To open the Levels dialog box, press ^+L/Ctrl+L instead of mousing to the Image menu, down to the Adjustments submenu, and then over and down to Levels. Figure 3-10: Assign custom keyboard shortcuts to speed your work. i Use ^+P/Ctrl+P to access Print with Preview. As you read in Chapter 4, you have more control using Print with Preview than you do with the simple Print command. Therefore it makes more sense to use the simpler and more common shortcut for that command. Locate the Print with Preview command in the dialog box (under the File menu) and click the current shortcut. Type the new shortcut. Note that Photoshop warns you that the shortcut is already in use. Simply change the Print command to ^+Option+P/Ctrl+Alt+P to resolve the conflict. i Change ^+Z/Ctrl+Z to use Step Backward. In most programs, pressing ^+Z/Ctrl+Z keeps undoing — reverting through a series of previous actions in the program. In Photoshop, however, that shortcut toggles an Undo/Redo function; that is, press once to undo, and press a second time to reverse the undo. Bah! 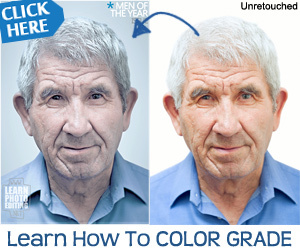 Make Photoshop conform to the undo, undo, undo behavior common to other programs. In Keyboard Shortcuts, under Edit, change ^+Z/Ctrl+Z to Step Backward and then use ^+Option+Z/Ctrl+Alt+Z to toggle between Undo and Redo. i Assign shortcuts to often-used commands. Smart Blur (or Gaussian Blur) can be assigned ^+Shift+Option+G/Ctrl+Shift+Alt+G. Smart Sharpen (or Unsharp Mask) can be assigned Shift+Option+U/ Ctrl+Shift+Alt+U. Perhaps use ^+Shift+R/Ctrl+Shift+R for the Image Size command. 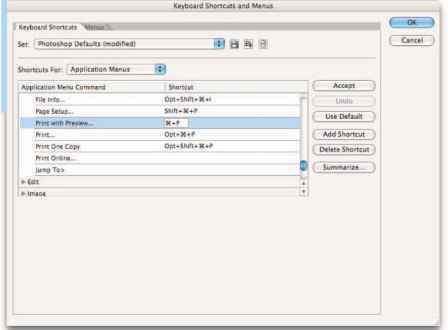 As you work with Photoshop, pay attention to other menu commands that you access regularly and memorize their keyboard shortcuts or assign custom shortcuts.